Islam Around Us: Egypt: Militants Kill 24 Army Troops In Ambush. Militants have killed 24 army troops in an ambush in the wake of the military's brutal crackdown, according to Egyptian officials. UK | 19 Aug 2013 :: Militants have apparently killed 24 military personnel in an ambush in northern Sinai, officials in Egypt have claimed. It follows the brutal suppression of supporters of the ousted president Mohammed Morsi, in which 750 people were killed. The military cracked down on the Muslim Brotherhood, raiding homes and making hundreds of arrests following scenes of bloodshed in Cairo. In response the supporters have pledged days of protest. It comes as European Union ambassadors are to meet today to discuss the crisis in Egypt amid international alarm at the growing death toll from unrest across the country. 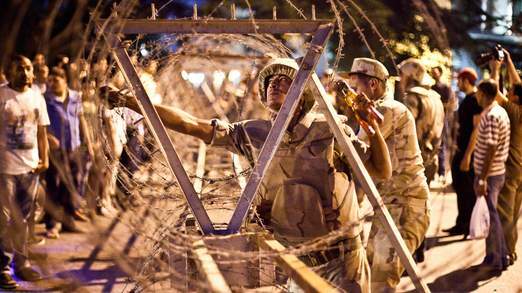 The meeting comes as Egypt's interim military government cracks down on the supporters of ousted president Mohammed Morsi. European Commission president Jose Manuel Barroso and the president of the European Council Herman Van Rompuy have issued a rare joint statement warning that the EU would "urgently" review its relations with Egypt over the coming days. Prime Minister David Cameron and French president Francois Hollande have called for today's meeting of ambassadors in Brussels to be followed by an emergency session of EU foreign ministers. Britain has condemned the "disproportionate use of force" by the Egyptian authorities and called on all sides to end the violence and to enter dialogue.